Anyways, I had purchased some ground pork to make Filipino Lumpia rolls, but I didn't have any wrappers on hand. 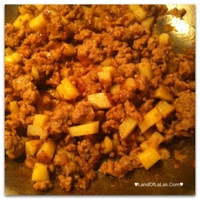 I Google searched Filipino ground pork recipes, and came across this blog. It seems it was deserted long ago, but this recipe caught my eye. 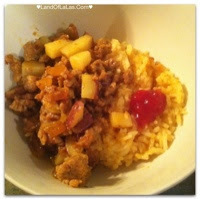 Its pretty similar to my picadillo recipe. But the main vegetable was carrot instead of potato, Raisins for sweetness instead of corn, and pork seasoned with salt, instead of beef seasoned with cumin. I cooked it up, and I was pretty happy with the result. I altered the recipe a bit to use the items I had on hand. This dish would be a good one to keep handy to eat with lettuce wraps, or with rice. I have never tried Pinoy style rice, but it paired well with my Mexican Rice. Heat up some oil, and sweat out the onion & garlic until fragrant. Season the pork, and brown w/ the onion on medium heat. Add the potatoes & raisins, cook for about 10 minutes. Add the tomato sauce, season to taste, cover the pan and simmer for about 10 more minutes or until the potatoes are fork tender. I served this with rice, and used a bit of ketchup (as suggested where I found the primary recipe.) The ketchup was okay... I think that would take some getting used to. I'd probably swap it out for sour cream, avocado, or salsa hahaha. Enjoy!